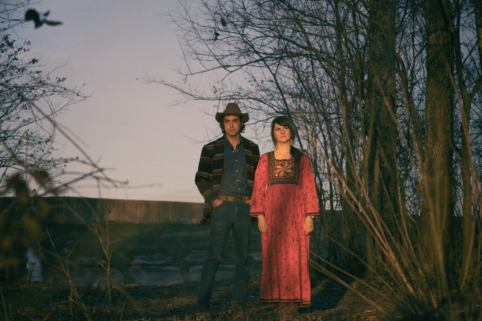 Clay Parker and Jodi James bring their “quiet, sweetly harmonized and unassuming but mesmerizing back-porch music” (Rolling Stone Country) from Louisiana to Gallery 263! Local staple David Johnston opens. Clay Parker and Jodi James are an acoustic duo from Baton Rouge, Louisiana. The pair’s use of dense harmony-singing and subtle musical arrangements indelibly binds them to the tradition of singer-songwriters and positions them well in the folk roots and americana strains of country music. Their sound borrows from and transforms traditional Southern cornerstones such as folk, blues, country, and Americana. However, though the duo remains loyal to the heritage that brought them together, Clay and Jodi are unafraid of experimenting further, often intermixing mellow psychedelia and cosmic country into their classic harmonies. Since meeting around 2009 and both being part of the close-knit Baton Rouge music scene, Clay and Jodi could occasionally be found playing on the same bill, but didn’t join forces until late 2014. Shortly thereafter they released a self-titled EP and have never looked back. Their new album inspired by Guthrie’s lyrics, The Lonesomest Sound That Can Sound, is the product of countless miles, the encouragement of friends, and a creative union whose existence was always inevitable.